After a quiet couple of weeks which have seen the young birds back at St George’s from time to time and reports from around Sheffield, all seemed to be progressing smoothly. 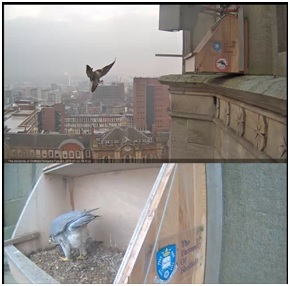 That changed dramatically on the morning of 8th July, when I received a phone call from the University’s security control room to say that one of the young Peregrines had been reported on the ground next to a construction site across the road from the church. A dash to the site led to me finding the bird between a wall erected around the site and a chain-link fence. Some quick phone calls provided some extra hands from Jim Lonsdale’s colleagues in the University’s Estates team and we then tried to devise a plan… After liaising with the helpful site security we removed one of the fence panels to get in behind it, hoping to be able to use a coat and a towel to capture the bird without injuring it. The space between the wooden boards and the fencing was clearly too narrow for the bird to be able to take off, but how it got there in the first place is a mystery. 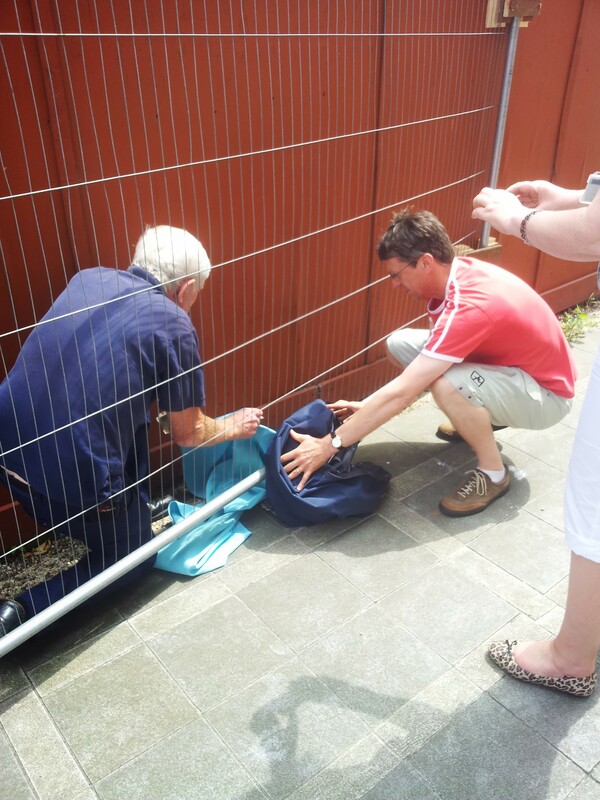 It flapped along the ground to try to get away but between the two of us we managed to catch it and carefully pass it below the fence, where it was placed in a large cloth bag to reduce stress as much as possible. The bird had flapped its wings and showed no obvious injuries, so we were unsure what to do next: try to return it to the tower, leave it on one of the elevated points of the churchyard or call for an expert opinion? 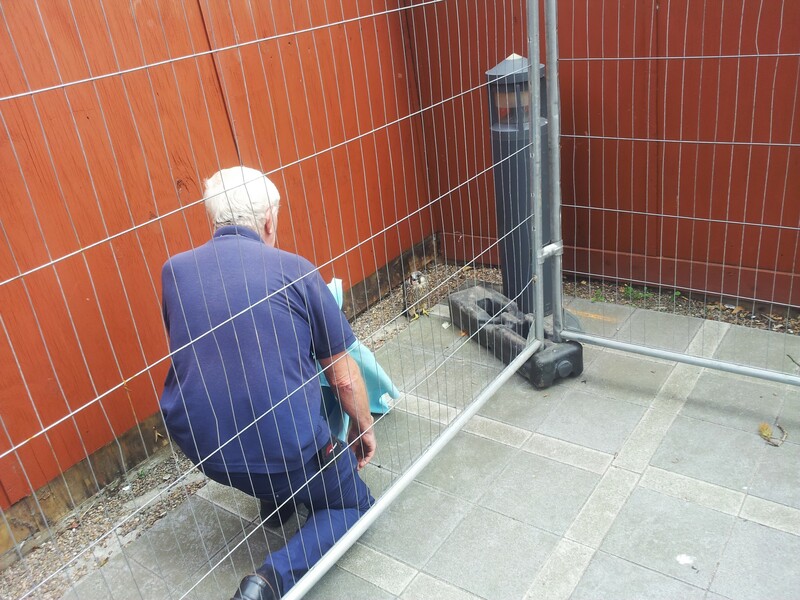 Given that the bird was on the ground, and could have been there for some time, we felt that all was not well and we needed advice from an expert. 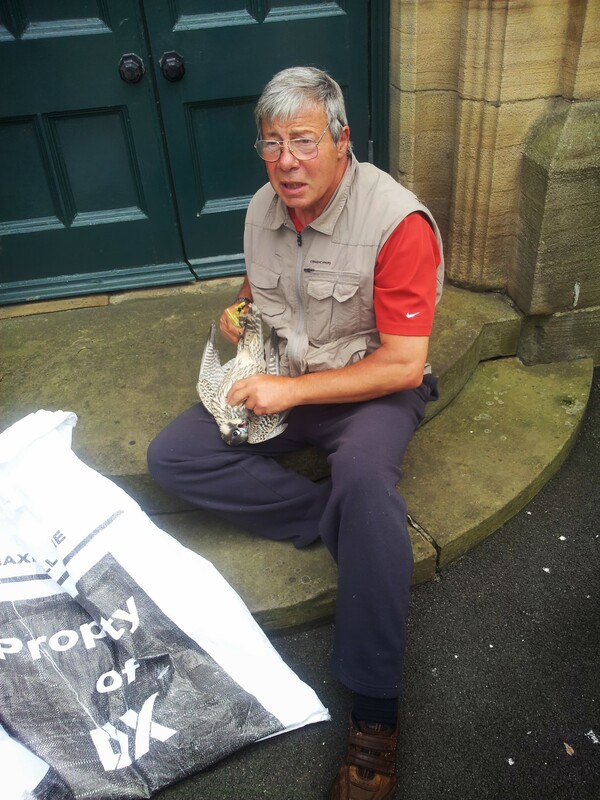 After some further discussions and phone calls, Pete Mella found a contact number for Geoff Mawson, experienced ringer of Peregrines and licensed in bird welfare. Fortunately, Geoff was at home, and set off immediately to come and meet us. On examination, Geoff could find no obvious injury and felt the bird to be in good condition, with both wings in perfect shape and no sign of under-nourishment (in the photo above Geoff is checking to feel for a good covering of fat around the sternum). It was also a chance to do a couple of things we’d hope to be able to do but which had not been possible, namely to take a DNA swab and ring the bird. Geoff was also able to confirm that it was a young male. 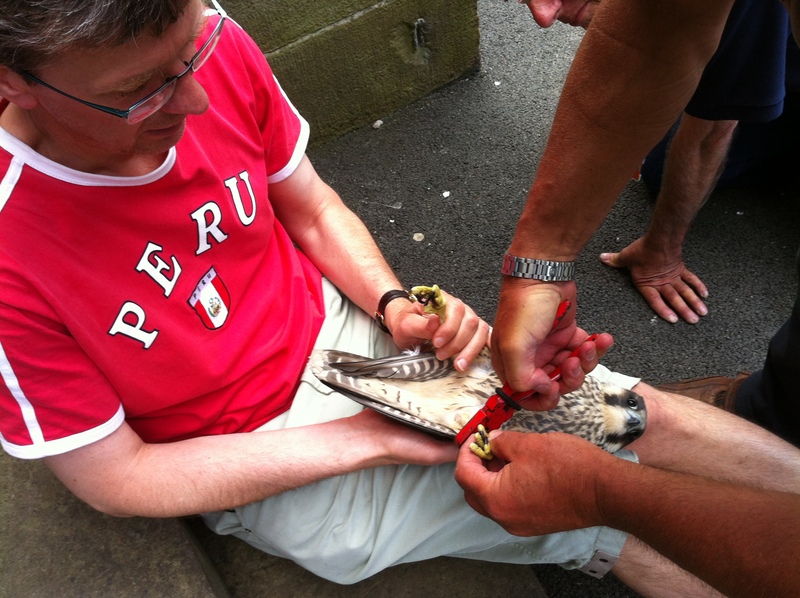 Taking the swab revealed some blood in the mouth, which was likely to indicate a collision… Nonetheless, the bird’s general condition encouraged us that it could be released and we took it part of the way up the church tower to let it out onto the lower level of the roof. When it was released it took off and flew – all was looking good! However, it quickly became apparent that it was losing altitude, and landed about 150 metres away on one of the side streets. I ran across and watched over it until Geoff arrived and re-captured it. We then decided to make one more attempt and let it into the air back at St George’s, where it again flew well but gradually lost elevation and ended up back on the ground after failing to land on the side of the Mappin Building. At that point it was clear that it wasn’t going to be able to fly back up to the church tower, and if we took it up to the top of the tower there was a strong likelihood that it would again fly off, lose height and end up further away or risk injury through another collision. 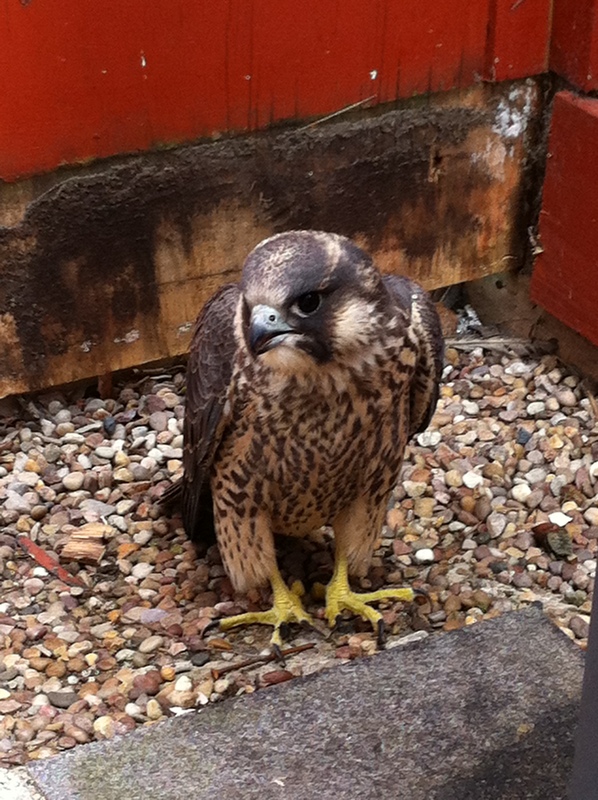 Geoff decided that it was time to take it into care and a box was provided by the men from Estates to allow safe transport to a raptor centre, where it remains at the time of writing. Geoff tells me it’s making progress, but is not yet flying strongly enough to be considered for release. That, though, is the plan, and with luck it will be released in the next couple of weeks, bringing a positive outcome to a set of circumstances that provided a very anxious hour or so. 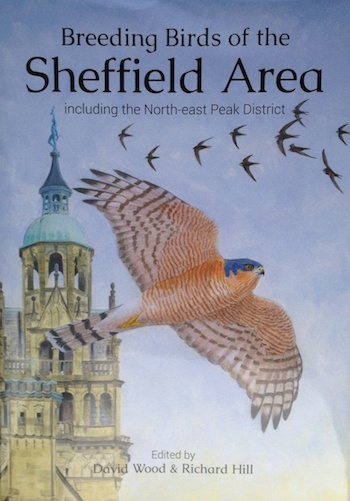 A word of thanks to Geoff Mawson, Pete Mella, Annette Fletcher and all the Estates team who helped capture the bird and provided the photos above.